July 23, 2016. The wedding images taken at Jupiter Beach Resort and Spa in Jupiter, Florida. 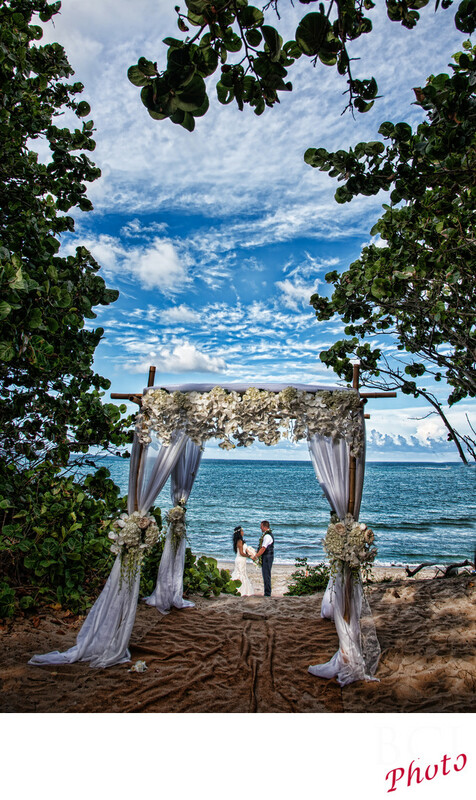 Here the bride and groom are shown in a romantic portrait on the beach as seen looking through their bridal arch on the bluff. Here the bride and groom are lit using off camera lighting in order to make them stand out and not be in shadow. Our beach wedding portraits use this lighting to augment the available light, in such a way as to make it appear natural like your eye would see the scene. The camera simply cant do this by itself however, and if this was only natural light, in order to get the couple properly exposed, the skies and water would have been completely blown out and not show any of that great blue color in the sky or the sea its fantastic color as you can see here. Lighting makes the difference. We are the light masters. Make the most of your wedding on the beach by using brads creative images to capture your big day.